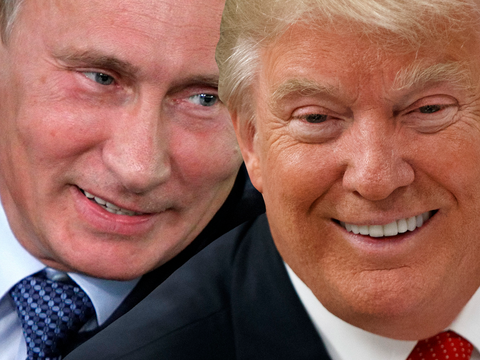 Trump & Putin - best of pals? Now that General Flynn has been fired (read resigned) of lying about his contacts with the Russians to the Vice, it looks like I am beginning to see what might undo the Trump presidency - LEAKS! There seems to be competing power structures or competing power dynamics within the administration, and they are all vying for the President's ear or his trust. So they are willing to sabotage each other to have a leg up with Trump himself. This comes in the forms of anonymous leaks. I see that these leaks and hacks are going to undo Trump's presidency. Think about it: how can you actually hope to govern or achieve anything if the details of your secret deliberations with your inner sanctum are somehow leaked, by members of that inner sanctum, to the press? How can you get anything achieved if your plans or policies are, before they are actually implemented or fine-tuned, picked apart -warts and all - on the media? You might remember that during the election campaign, Trump smiled at and had fun with the fact that Russian hacks and leaks brought down or at least massively undermined the Clinton Campaign and eventually allowed him to win. He will find out soon enough that the same odious leaks and hacks are going to be deployed to undermine his administration. He is already crying about it, but it is only going to get worse. We have seen people parting company with Trump since the night he officially won the election. We shall see even more resignations or firings in the months ahead as the gross incompetence of his administration starts filtering out in anonymous leaks. In fact, it is beginning to look like there is something that the Russians have on Trump - some kind of bargaining chip or trump card (pardon the pun) - that they know they can use with devastating effect on Trump. They have succeeded in making Trump "Putin's lapdog". It now leaves you to wonder what Trump's feckless and compromising deference to Putin might mean for the balance of American relations with Russia. Trump can run his mouth and attack anyone but when it comes to Vladmir Putin, a known thug and dictator, Trump becomes a meek lamb or worse a muzzled pitbull. This is an assessment that should have already begun to crystallize for even Trump's most ardent supporters. If they are capable of any self-introspection, Donald's transparently servile deference to Moscow should be worrisome if not downright frightening. No one should have easily forgotten that he eased up the tough sanctions put on Russia by Obama for Putin illegally annexing Crimea from the Ukraine; then appoints Putin's pal Tillerson as his Secretary of State - a move speculated to help yield some financial dividend for Trump himself in the form of oil and gas money. Nor should anyone forget that Flynn, his former National Security Adviser, with his knowledge and blessings went to placate the Russians behind the scenes when Obama, in his last acts as president, decided to punish Russia for their meddling in the elections by slapping on more sanctions and sending some diplomats in the US back to Russia. The Russians did not retaliate by repatriating American businessmen or diplomats back - a move that would have doubtlessly ratcheted up international tension between the two countries. For this, Trump comes out and praises Putin effusively for being a wise leader. But perhaps, the most chilling should be when Trump chooses to make a moral equivalence by negatively pointing a finger at the US when Bill O'Reilly confronted him with the fact that Putin is a killer who has massacred his opposition and killed journalists. For a man who was openly and eagerly willing to say negative things about his predecessors in office contrary to their tradition, and had not shied away from speaking forcefully against the Pope, you have to wonder what sort of leverage Putin has on Trump to compel such kowtowing deference. Not even when Russia broke a treaty and testfired a missile recently could anyone get Trump to utter the mildest form of censure. What shall we discover down the line as more and more leaks come out? How badly compromised and given over to the Russians - our archenemy and global rival by the way - is Trump and his administration before Americans wake up and decide to do something about it? Flynn is gone, but this is just the beginning. One hopes against this but it is looking like leaks centered around Trump's incompetence (or worse his duplicity) are going to spell the end of this administration - more efficiently than any number of passionate protests ever could.